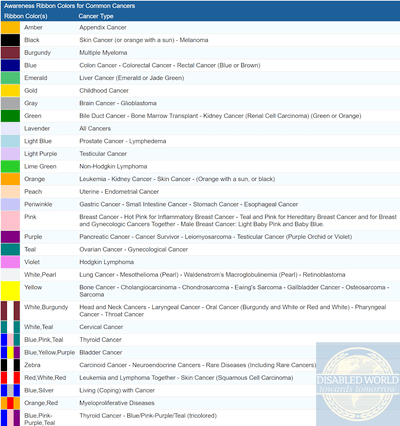 Synopsis : List, table and printable chart outlining the colors of awareness ribbons that represent different types of cancer and their causes. Cancer is defined as a group of diseases involving abnormal cell growth with the potential to invade or spread to other parts of the body. The majority of cancers are due to environmental risk factors, and many - but not all - of these environmental factors are controllable lifestyle choices. Many cancers today can be prevented by not smoking, maintaining a healthy weight, not drinking too much alcohol, eating plenty of vegetables, fruits and whole grains, vaccination against certain infectious diseases, not eating too much processed and red meat and avoiding too much sunlight exposure. Today's cancer research ranges from epidemiology, molecular bioscience to clinical trials to evaluate and compare applications of the various cancer treatments including; surgery, radiation therapy, chemotherapy, hormone therapy, immunotherapy and combined treatment modalities such as chemo-radiotherapy. Pink Breast Cancer - Hot Pink for Inflammatory Breast Cancer - Teal and Pink for Hereditary Breast Cancer and for Breast and Gynecologic Cancers Together - Male Breast Cancer: Light Baby Pink and Baby Blue. NOTE: This is not a full list of all ribbon colors for all cancer types, it will be updated as other colors for cancers are verified. Printable chart of awareness ribbon colors for various types of cancer.